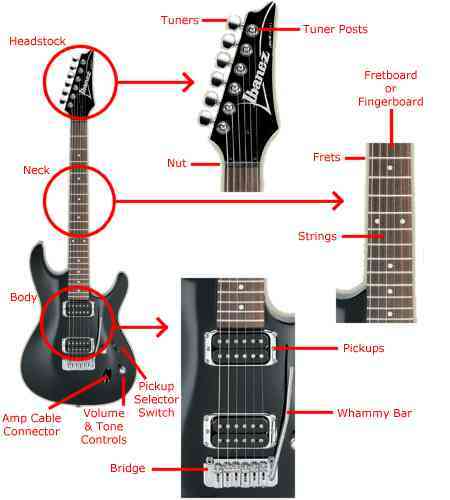 Here is a picture of a typical electric guitar with its parts marked. Click if you want to jump to the Acoustic Guitar Parts or to selecting an Acoustic or Electric Guitar. Scroll down for detailed information on the electric guitars parts. There are three main sections zoomed in the picture; the Headstock, the Neck, and the Body. The headstock holds the Tuner Posts around which the strings are wrapped and terminated. The Tuners are knobs that increase or decrease the tension on the string wrapped around the tuner posts (tuning the sound made by the strings). Note that some electric guitars may have different looking tuners, and some may even have three tuner keys on opposite sides. Even though they may look different, they work in the same manner. The Nut guides the strings to the tuner posts and maintains the height of the strings. The length of the Neck depends on the scale of the guitar and the number of frets it has. The back of the neck could be "C" shaped, or "V" shaped (sideways < if you compare it to the letter C). The front of the neck is the Fingerboard or Fretboard, that contains the Frets embedded in notches along its surface. The Strings run down the neck over the frets. The height of the strings over the frets is called the Action; if the action is too high the strings are harder to press down, if the action is too low the strings may rattle against the frets muffling the notes. The neck usually has "dot" markers on the top and the side facing the player, showing the position of the 3rd, 5th, 7th, 9th, 12th (which has two dots), 15th, 17th, 19th, 21st, and 24th (which also has two dots) fret. Note that not all electric guitars have 24 frets. Those guitars that do have 24 frets will have smaller spacing between all the other frets, which is may make things a little difficult for large hands and fingers. The body of the electric guitar has one, two or three Pickups under the strings. These electro-magnetic coils "pickup" the vibration from the strings and send it to the amp. There are two varieties of pickups, single-coil and humbucker (dual-coil), and electric guitars have different combinations of these pickups in the three possible positions - closest to the neck, in the middle, and furthest from the neck. A Pickup Selector Switch allows you to choose which pickup will be active, some models even allow you to select combinations of pickups for unique sounds. The strings terminate in the Bridge, some versions also have a Whammy Bar to create Tremolo effects (by rapidly pushing the bar in and out, changing the angle of the bridge). Volume and Tone control knobs are also present on the body, allowing you to make minor changes to your guitars sound without having to fiddle with the amp. A Cable Connector allows you to connect a cable from your electric guitar to your amplifier or effects pedal. Click if you want to jump ahead to selecting an Acoustic or Electric Guitar or to Buying an Electric Guitar.